Good morning everybody, regulars and newcomers alike!! It's day one of the Strip-Smart Quilts blog hop and I'm glad you're here having a bit of a PamKittyMorning with me! Strip-Smart Quilt's is a great book. It's not just pretty styled shots of quilts, it's excellent instruction and illustration and of course the designs are wonderful. The ruler is pretty darn cool as well. The whole book is filled with Kathy's southern charm and humor, not to mention her tips on piecing, pressing, pinning and G.R.I.T.S. (but you need to ask her about that!) And of course the most exciting thing for me, I pieced one of the quilts in the book for Kathy! When she asked me what fabric I'd like to use I picked Bonnie and Camille's Bliss that had just been introduced at quilt market. I'm just showing a snippet here, I'll let Camille show off the whole quilt, it turned out so pretty! Of course the book is filled with friends, Laurie and Polly's fabric on the cover quilt, and Monica's Holiday Happy here in the Penny Candy quilt. Kathy made Daydream Believer in her own line of fabric Ella. 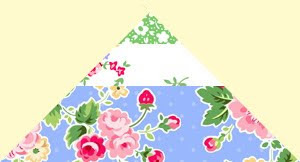 I can make a little digital block unit from my own PamKittyMorning fabric till can make one out of the real thing! I know I mentioned prizes and you're in luck! Just leave a comment today and Kathy is going to select a winner to receive not only a copy of Strip-Smart Quilts but also a ruler to go with it! Stick with us on the tour, I hear rumor of a grand prize at the end!!! Looks like another great book to add to my 'want' list! And thanks for another great blog hop, I love these. 15 designs from ONE easy technique -- now THAT'S for me! I can handle learning one new technique!! And if I can use my leftover scraps -- even better! This book looks awesome. And we Southern girls know what G.R.I.T.S. stands for. It's Girls Raised In The South ;-) Hey Ya'll!! Thanks for the preview of Kathy's book. Looks like a good book!!! Congratulations on getting to piece one of the quilts for the book! Now I want the book even more :) thanks for the sneak peeks! Now that I'm machine piecing my quilts, new techniques are very intriguing. I really like what I see here. Love your photoshopped block! Would love to test this book and ruler out! I'm going to love the hop. Thanks for your part in it, and I can't wait to see the full quilt you pieced. Looks very pretty. The book looks great! Thanks for the preview. Hops are always fun. This is my first one online. Looks like a great book. Looks like a fun book! Can't wait to try it out! I have lots of fabric that I could use for these quilts. Can't wait to see more about this book and the ruler. I was recently admiring this book, so I was very excited when I saw the blog hop! I'm looking forward to the fun! I would love to win the book and ruler! 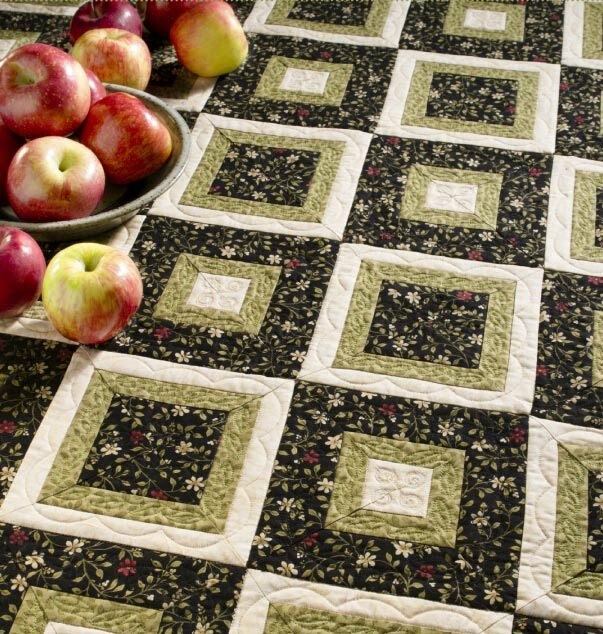 Love the quilts shown, and your digital block is the prettiest! Would love to see the whole quilt made of those fabrics! Thanks for the chance to win! Your post is a great kick off to the blog tour! Bliss is a great fabric choice! Looks like this could be a lot of fun! Thanks for participating in the blog hop. I also love the Bliss fabric you used!! Thanks for an opportunity to see some of your work. Looks like a fun book PKM. I'm looking forward to seeing quilts with your fabric -- photoshopped or otherwise! Looks like this new book goes on the list of must haves. I can't wait to get my hands on it. Very nice! Looking forward to the new book! We have Ella in the quilt shop where I work and it's a lovely line!!! Looks great! love to have a good look! The ruler and book would be great, I am a newbie and need all the help I can get. I like the look of the quilts you showed from the book. The designs look more complex than the usual jelly roll patterns, yet I bet the ruler makes them just as easy. I can't wait to see all the quilts in the book. I've watched tutorials on this ruler and it's pretty cool! Looks like a winner so I need to get it or win it. Cool! I've made two Teacher's Pet patterns. Looks like a great book! I'm excited for the blog hop! Looks like a great book... I love the cover quilt. (and I love that blue print from your fabric!) Thanks for the chance! The book looks like it has some great ideas for using up scraps too. Count me in! This ruler looks amazing! I just clicked on your "ruler" link and watched the video. I'm always looking for fun new tools to share with my guild. Kathy's book is beautiful! Thanks for the sneek peek! I have a ton of fabric I could use - but all the new fabric lines seem soooo much more appealing! Would loke to have the new book and ruler! Thanks for the peek! The book looks like it is filled with great designs and the ruler looks like it would be a very exciting time saver. That's for me. Looks, like a must have, this is my first blog hop, looks like it's going to be fun & informative. Nice bright start to the day. Thanks for having me. So excited to see the book. Thanks for the giveaway. What a great book! And that ruler.....count me in! I would love to pick out a new quilt to try and one with a ruler is special! This looks like it is going to be a great book and I can't wait to see your fabrics in person. They look so cheerful! Oh, love the prizes! Thanks for doing this! This looks like my kind of book--fun! This looks like a great book to help me figure out what to do with my jelly rolls. I am always in the market for new tools. Count me in. Would love to add "Strip-Smart Quilts" to my library. The ruler looks neat too. This book looks fantastic! And I love the quilt in the Bliss line! I'm excited about a new blog hop. There's always so many neat things to see. Looks like a fabulous book. Thanks for sharing. Your fabrics are lovely! I can't wait to see them for reals and in person. I love the idea of 15 designs from one technique. Can I win even if I'm a California girl? The new strip book looks like it is full of great new ideas for us! I would love to win this book (and ruler) for some new inspiration. What a treat. LOVE scrap quilts!! And love learning something new. Thanks for the chance to win!! Good PamKittyMorning to you. This book looks like it is filled with wonderfulness. I would love to win a copy. Congratulations on having one of your quilts in the book. One of the things I enjoy about a "blog hop" is the chance to "meet" other fun quilters and the exposure to their creativity. Of course, winning a book would be a big plus, too! This book looks like it has some fun projects. I'd really love to have a copy. Thanks for sharing and congratulations on being able to be a part of it!!! That book caught my eye the other day! Those are some awesome quilts. Thanks for being a part of this hop and giving us a chance to win. Looks like a great book with some great designers that used some great fabrics!! A girl just can't ever have too many books or rulers. Count me in with the others who are coveting this prize! This looks like a great book. What I've seen there are some beautiful quilts in it. Oh my gosh, I would love love love to have a copy of the book and a ruler. I would also join a quilt-along too, this would be my first experience with that. How much fun would it be to do a project along with others? It would be awesome. I don't live near any quilters, and none of my friends are sewers or quilters. It's like a whole new world on these blogs, isn't it? Please come visit me at my new blog, Ric Rac and Polka Dots. I am brand new, but have lots of really fun stuff planned to share with everyone. I hope to see you there! And if I win, I'm in!!!!!!! Another chance to win the Book and Ruler! YEA! This book blog tour is going to be fun.....the designs look easy and fast!! Thanks so much for the giveaway and the opportunity to win this fabulous book and ruler! This looks like a fabulous book with really pretty quilts. I would love to try out that ruler! Love the versatility of this ruler! The book looks awesome! It looks like a book with great projects. Would love to have this book and ruler! Great summer time projects. This looks like a wonderful book so here's hoping! The book and ruler look like one I "must have"!! I am looking forward to seeing all the quilts! Thanks for the opportunity to win! Can not wait to see more. The book looks very interesting. oh goodness these quilts look gorgeous. I haven't gotten a book in a while so I'm adding it to the list. It's awesome to see another Louisiana quilter! This book looks like so much fun! I want one! It's so great to have access to so many talented people! You gals all rock. I can't wait to see the patterns and most of all I want that ruler :). Thanks to all the great quilters. I am looking forward to seeing more about this new book during the blog tour. I haven't tried this ruler but it looks very interesting. Thanks for the chance to win! Thanks for the preview! I'll have to add this book to my wish list. This new book is awesome!! Can't wait to try the ruler!! I saw Kathy's truck show at our quilt guild meeting. The quilts are dazzling! Thanks for the blog hop. Can't wait to get a copy of this book & start sewing. It will be hard to decide which pattern to do first. Looks like a great book. I'm just starting to quilt and so excited to follow this blog hop and get lots of ideas. sounds like an interesting and fun book and tool. would love to win it!! I can't wait to see more of that book this week! The ruler looks interesting too! thanks for a chance to win/I could use some luck this week! This looks like another must-have book. Can't wait to see more. Just put the book on my Amazon wish list! Great blog hop. Congrats on having a quilt you sewed in the book. It looks like a great book. Can't wait to see something in your fabric. Looks like a nice book! Looking forward to blog hopping! 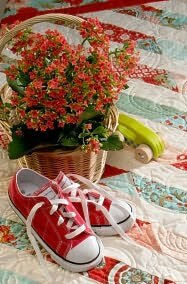 Quilting with strips is such a great way to go. Looks like a great book- and I would love to try that ruler! Thanks for the chance to win. I THINK I "NEED IT! throwing my hat into the ring with hopes of winning the book and ruler. I'm excited to follow this blog hop since I'm just getting back into quilting and feel like I need a total refresher! I've seen this ruler before and I wasn't sure how it was to be used. I'm glad to see there is a book that features it - looks like a great one! What a wonderful book! It would sure help me with my growing stash pile! Wonderful looking book! Thanks for the opportunity to win it! The book looks interesting, something I'd love to have in my collection! This hops will certainly be fun, can't wait to see what's next! I'm intrigued with this new technique! This looks like fun! And the ruler intrigues me! I love this book! My friend purchased this book two weeks ago - and I have had a brief look at it! The patterns are beautiful and the ruler is a very cool idea! Just hope I can win a copy since I cannot pry it out of my friends hands - LOL! I can't wait to get my hands on that new book! this book looks fun thanks for the chance to win one!! I think I need that book, the ruler and some new fabrics to go with all the projects in book!!! I love the looks of the patterns in this book....I prefer a pattern book where more than one pattern appeals to me, this book has several. Thanks for the opportunity to win. Already added this book to my Amazon shopping cart in case I don't win it. Looking forward to more sneak peaks suring the blog hop. What a fun way to kick off the summer! Thanks so much. This looks like a great book to win and buy if I don't. I like the Bliss stripe. Thank you for the chance. girl....Florida is pretty south. Can't wait to be able to buy your fun new fabric line....keep up the great work. I can't wait to see your quilt in full since I do have some BLISS sitting here just begging to be used. The book looks great, and so does the ruler! I'd really like to know what G.R.I.T.S. means--the ruler and book look like they'd provide alot of fun quick quilts. That new ruler alone is gonna make this hop fun. I'm gonna follow every day for lotsa fun along the way. I'm hoping I have some luck today in winning - great looking book and interesting ruler. What a neat combination! This looks like a really cool book! I so hope to win one. The book looks great. The fabric choices are so beautiful. Would love to win it. Thank you. I'm a new quilter - self taught. This would be a great book to introduce me to more ideas. Thank you for inspiring. Wow! What a great book! I would love to win! I would love to win Kathy's book! I am a Southern gal too. I know what GRITS stands for! Another fabulous book!!!! I'm down south - in Florida. I know what GRITS stands for. I'm so hooked - I want a PKM tattoo!!!!! This book looks like it has some great quilts in! The book sounds very intriguing. The photos from the book on your blog are beautiful. Thanks for being part of the fun! I can't wait to see your whole quilt out of Bliss! I'm going to have to get this book! WOW - I need this book and ruler. I love the sneak peek that I have seen and the U-Tube video! Love the possibilities. Thank you for allowing me to participate in this blog hop. Great fabric choice! Glad you were on this hop. I have enjoyed looking at your blog! I think you'll make it on my list of ones to check frequently! This looks like a book that I MUST have!!! Can't wait to purchase this one!!!!! I saw this book IRL today, and it is totally awesome! Would LOVE to win one, thanks for the chance! The book looks wonderful and from the peek you showed, the quilts must be fantastic. Can't wait to see it. The book looks and sounds fabulous. I'd love to win it! You're such a rockstar and love the quilt you made for Kathy's book! I knew Kathy was using Holiday Happy for one of her books, and didn't realize it was this one - I'm so tickled we're "in it" together! And Camille and Bonnie, and Laurie and Polly… it's like a slumber party! Thanks for the sneak peek,the book lookd wonderful.Thanks for the chance. Looks like it is a great book! Can't wait to see more of it in this blog hop. OK anything Pam Kitty is involved with..... count me in!!! Sounds like a great book. Please count me in the fun! "One Easy Technique" - I like the sound of that!!! I just browsed this book at the quilt store and put it on MY List! This looks like a great book. Any book that gives great instruction along with the beautiful inspiring pictures is one I like. That awesome ruler was already on my wish list so it would be wonderful to win one. Another great book..I need it!!! What fun! Looks like a great book! Thanks for the chance to win. Beautiful book and neat ruler. Book looks interesting! I look forward to the blog hop. Wow! Looks like a great book with pretty quilts to make. I need to get that book! What a fun looking quilt! The pictures you've shown are beautiful! These sneak peeks look very intriguing....Thanks for the opportunity to win a copy of this book! ME ME please be ME!!!!! The book is on my wish list! So much work goes into one of these books and it is great to the support of the team behind the author. This sounds like a great book. I'll have to look for it when I get back home next week! Love the pictures you shared, thanks. Would love to try out a new book and ruler. Thanks for the chance to win. Looks like a great book. I can't wait to see the real thing. Thanks for the give-away. I'd love to win a copy of the book and the ruler. How awesome! OK, the ruler video has me hooked. Also, love the fresh, crispness of your fabric! This is my first blog hop and not sure how it all works, but will check in each day and figure it out. Looks like a great book . . . and the ruler is quite intriguing. Can't wait to see more . . . So excited about the book and hoping to try the rulers soon. My list of 'wants' grows and grows so I just added one more. Make that two if I include that ruler. Looks like fun. Thanks for the chance to win one. Love Love Love this book and the opportunity for a chance to win it..too sweet! Your fabric would look super cool in any pattern, but that ruler is very intriguing! From that hint of the quilt you made, I'm really eager to find the book. Thanks for the opportunity. Would love to get my hands on this great book! Wow, what a generous prize, would love my number to come up for this one! Thanks for theninspiration and sharing! Great design- I love your "snippet"! 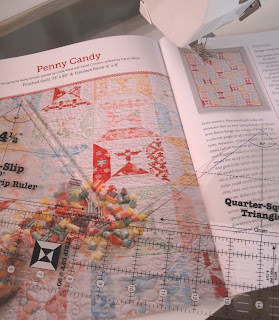 I already bought the book and I love it...need the ruler, but I am going to make several of these quilts. Thanks for the chance to win. Fun new ruler and book. I'm thinking I want a copy of my own! Would love to look further into the book and try the ruler. Looks like a great book and ruler. Oh, it looks like a fabulous book and ruler. It will help me to make beautiful quilts so much faster. I hope I get picked!!!! Another book for the wishlist!! !